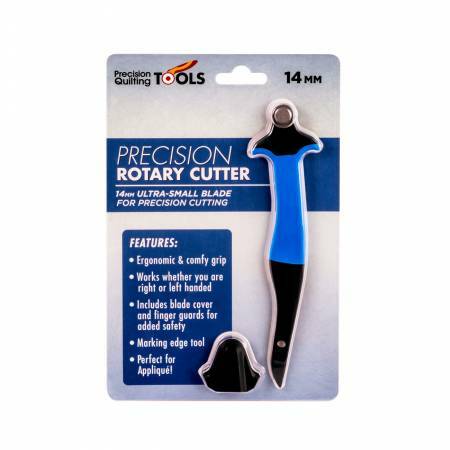 14mm Precision Rotary Cutter by Precision Quilting Tools. Use this 14mm Ultra-Small blade for Precision Cutting. Designed with an ergonomic and comfy grip, it can be used whether you are right or left handed. Includes blade cover and finger guards for added safety, along with a marking edge tool. Perfect for Applique and collage cutting! Interquilten opened in March, 2009, with a desire to supply our quilting community with color, creativity, and inspiration! Come see our wonderful selection of cotton prints, batiks, and hand dyed wool!